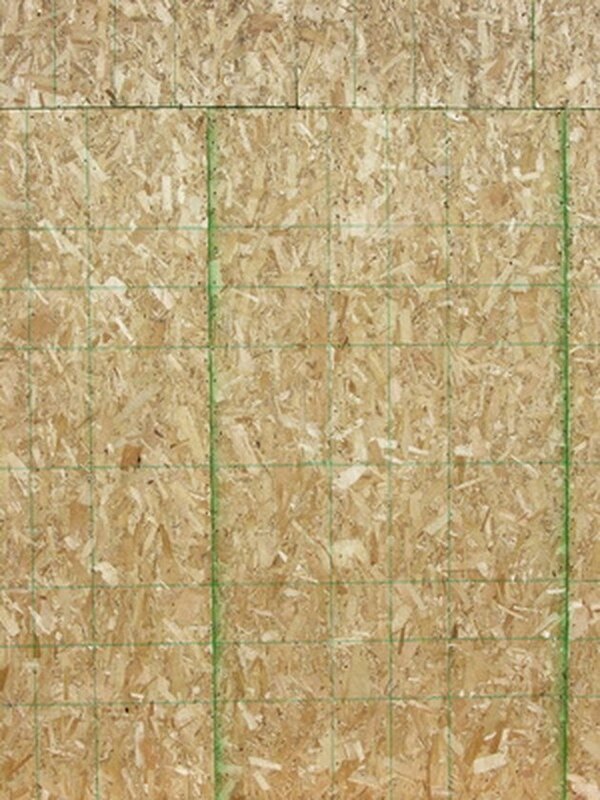 OSB (oriented strand board) is similar to plywood and used primarily for subfloors, covering exterior wall studs and roofing. It is not usually stained or painted, but that doesn't mean that it can't be done. OSB used for interior and exterior projects will accept stain and clear coat sealing products. Although it is a tough form of processed wood, but it will rot if it is left outside untreated. Untreated OSB panels can be stained and sealed. Lay a panel of OSB on a pair of sawhorses. Raising the working height will reduce fatigue while you sand and stain the wood. Sand the entire surface of the OSB panel with the palm sander and 100-grit sandpaper. Dust off the surface and sand again using 150-grit sandpaper. Sand once more with 220-grit sandpaper. Each consecutive sanding provides a smoother surface for the application of stain or polyurethane. Mix the stain with a stir stick. Stain pigment settles in the bottom of the can when it sits on the shelf for a long period of time. Apply a thin, even coat of stain on the OSB panel with an all-purpose, 3-inch paintbrush. Allow it to dry according to the manufacturer's recommendations--some oil-based stains can take eight or more hours to dry. If you want the OSB darker, brush on a second coat of stain and allow that coat to dry thoroughly. Paint a polyurethane sealer on the OSB with the 3-inch paintbrush. Allow the sealer to dry for the time that is recommended by the manufacturer. Drying times vary, and can also take up to eight hours. After it is dry, lightly sand the surface with 220-grit sandpaper. Wipe off the sanding dust, apply a second coat of sealer, and allow that coat to dry. When the second coat of polyurethane is completely dry, the OSB is ready for use.